The pump should definitely be improved. Backpack and Leash are not included! It seems to be raining inflatable SUPs of late. Recently, I reviewed the stellar Solstice Bali, and was impressed by how far cheap inflatable boards have come. Some boards have the innate ability to feel just right at the very first touch or paddle. You can put it down to design, the board’s construction, or simply how it makes you fell out on the water. The Ten Toes Weekender is one such board. The moment you hold it in your hand, you feel as if the two of you will probably share a special relationship. One reason why theWeekender feels so right is because of its carefully constructed foam body. If you are looking for tough, no other material comes closer than military-grade PVC. It acts as a protective shell for the 10-inch board, bestowing on it an aura of invincibility and indestructibility. This outer covering is filled with layers of premium foam. There is a base cloth on top of which sits two layers of high-density sheets. The three layers are then topped with an extra supported fabric that lies just below the PVC. The result: a six-inch-thick body when inflated that will feel like another hardwood board. A lot of attention has been paid to the board’s construction. Right from the material used to the SUP’s assembly. All the elements are held firmly in place with an impenetrable 6” drop stitch. This serves to add more thickness and stability, which are important factors for an inflatable SUP. The superior drop stitch weave also allows the board to take a fair amount of abuse and still hold its own. This will hold special interest to newbies who are probably still getting a hang of the leisure sport. The pros too would love to have a board that they can ride around a bit rough. The rigid construction allows the Weekender to glide smoothly on the water, providing a great response to the paddle’s thrust. Staying with the top of the board, your feet will love the feel of the non-slip EVA pad that sits on the rear of the board. The pad provides a soft, cushioning comfort for your feet while holding them down firmly in place. The feet don’t feel tired even after hours spent on the board. Your knees too will feel absolutely comfortable on it if you are in the mood to kneel and paddle. This may come as a surprise, but Ten Toes have provided an extra portion of tracking pad. In case the original wears out, you have an additional one to replace it. Now that’s what I call paying attention to detail! At first glance, you may not notice it, but a closer inspection will reveal a design gem that sits in plain sight – the board’s nose. The reason why I have brought it up specifically for this board is that the nose plays a very important role in the overall performance. It gives a SUP its primary characteristic: a sleeker nose for faster speeds, and a flatter one for more stability. When it comes to the Ten Toes Weekender, the nose has a bit of lift and is rounded. This gives the inflatable SUP a versatility that is impressive. Take it out on flat waters, and the board will track well. Use it to tackle choppy waters, and the board will navigate them without trouble. Even waves do not present a problem as the nose allows you to ride them without breaking into a sweat. Talking of sweat, you can use the solid, stable inflatable SUP to perform your morning yoga on the lake. From the top of the board I now move to its underbelly. Most inflatable SUPs come with one removable fin. This allows boarders a certain amount of customization. The Ten Toes Weekender has kind of pushed the envelope here. It is perhaps one of the rare inflatable boards that allow you to remove all three fins. Yes, that’s right. You can play around with one large fin in the center for challenging waters, remove all three if you encounter debris in the water, or go for all three in flat waters. I have done a post on fins and how different combinations allow different attributes. The fact that you can chop and change all three on the Weekender is just an extension of its impressive versatility. The board truly feels like many SUPs put together in one. What makes the customizable fins even better is that they can be removed and attached again with a minimum of fuss. They are secured easily in their slots with a push-in clip that locks them in. Once they are set, they will not budge. Any review of the Weekender would be incomplete without a mention of its chic look. The design is minimalist, which only adds to its allure, and the color palette makes the board a stunner to look at. You can choose from a range of color options. There’s red, blue, green, and aquamarine. My favorite though is the black board. The Ten Toes Weekender is a stellar board, and I am really nit-picking when I say that it could do with an extra D-ring at the front of the board. The board has four of them attached to a bungee cord. An extra ring can go a long way when you have something extra to carry. The other aspect that is a bit disappointing is the hand pump provided. It is not the worst, but it is certainly not top notch either. You may need to spend a good eight minutes or so pumping the board to its ideal pressure (12-15 psi). I would recommend that you invest in an independent pump, preferably electric. Last but not least you should keep in mind that the backpack and leash are not included. A backpack should be included with an inflatable in my idea, and a leash is definitely a nice extra. Keep that in mind, so you’re not disappointed when your SUP arrives. 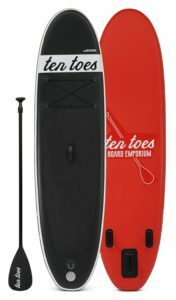 When I look at the Ten Toes Weekender, I see a near perfect inflatable SUP for beginners and casual paddlers. Solid construction, cool looks, stellar performance, versatile, and available at an economical price point. It looks like we have a winner with the Weekender. I totally agree with investing for an electric pump, saves you a lot of time and effort. I just got this board today and really like it! I have an electric pump but not sure how to use it with this board. Doesn’t seem compatible. Also curious how you know how firm it is? Total newbie here:) thanks! sorry for the late reply. I somehow missed your comment. What kind of electric pump do you have? If it doesn’t fit the valve you can usually get something like this on Amazon: https://www.amazon.com/Slingshot-High-Pressure-Inflator-Valve/dp/B00K6NDLHU/. If you pump doesn’t have an integrated pressure gauge that’s a bit of an issue. The Weekender can be inflated to max. 15 PSI. Depending on your weight you can go lower than that. However, you don’t want to inflate it past the 15 PSI. The hand pump that comes with the board has a pressure gauge. Alternatively, you can get something like this to make sure you don’t exceed the max PSI with your pump. I’d like to use this for cruising and riding SMALL waves (not necessarily carving them up). How does it do in the ocean? Are ISUPs ok in areas with Oyster Beds? You can definitely ride some small waves with the TenToes. It’s a great allrounder and won’t let you down in the ocean. Oyster beds I’m honestly not too sure about. iSUPs are super rigid and hitting some oysters won’t cut them up right away but if you paddle in areas with oysters a lot I’d probably go for a hard board instead. They can withstand a bit more abuse and especially sharp oyster edges won’t be great for you iSUP long-term. I am looking for an all around board for rivers and lakes, the lakes will be sometimes flat water, but it is windy here and lakes are busy with other traffic. I weigh 200 lbs but the board would be used bu riders weighing 125 lbs as well. Trying to decide between the solstice bali and the weekender. I note that several sources say the Bali is fast, which makes it sound interesting. Budget is a factor but these 2 boards seem pretty comparable in price. Can you recommend one over the other for my application? I’d choose the TenToes over the Bali. It’s a bit higher quality and overall the slightly better board in my idea. If you’re interested in a fast board check out the iRocker Sport. It’s in a similar price range and definitely faster than both the TenToes and Bali. Still stable and beginner friendly though. 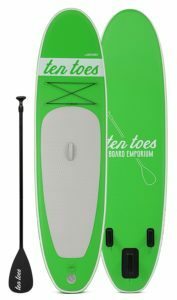 I am looking for an all around board for rivers and lakes too, Trying to decide between the isle Peak and the weekender. Any recommendation? I’d go for the Peak to be honest. The difference in size is up to your preferences (TenToes 10’x30″x6″ vs. Peak 10’6” x31″x6″). The fine details are what make the peak the slightly better board in my idea. Given that the TenToes is more expensive than the Peak if you include the costs of the backpack I’d definitely go for the peak. thanks a lot for your reply, one last question, I’ve read your review on the irocker and you get me thinking….I read that the pump is easier to use, and also I can purchase the kayak bundle. So, the peak and the irocker, which one should I go with? I guess you’re talking about the iRocker All Around? It’s a fairly similar board and doesn’t have any of the flaws I pointed out in the TenToes. The All Around comes with all the extras, a great backpack, it’s lighter…. You get the point. Both are great boards to be honest. Is the iRocker worth the extra $100 it currently costs? Hard to say. Do you prefer the extra length and 1″ extra width? Any design preferences? Do you want the kayak option which is an extra $60? Quality wise the boards are on the same level so it’s really up to you, if you want to get the extra kayak seat which can be really fun. I was reading your reviews, and I am having a similar debate between the isle PEAK and the ten toes yogi. 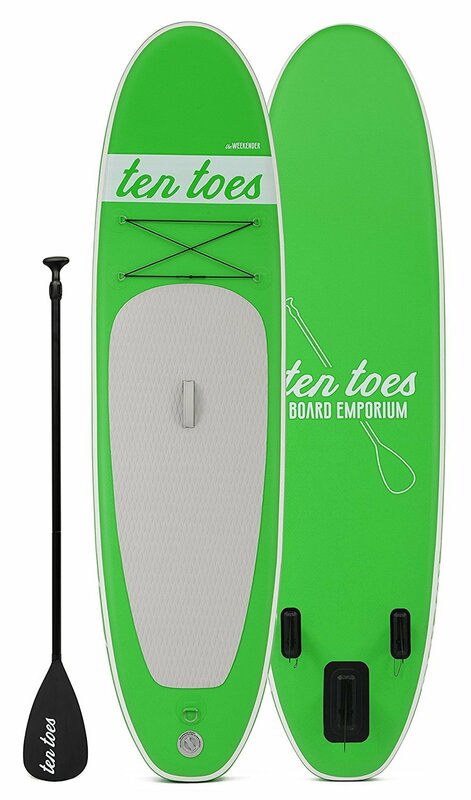 I like that the ten toes has more pad for yoga positioning but I want something that is going to work for both yoga and paddling on lakes and I’m afraid the yoga boards aren’t going to be as maneuverable. Any suggestions? I ended up buying the irocker cruiser. I just received it today! Hi, I was looking between Weekender and Thurso Surf 10’7 water walker. 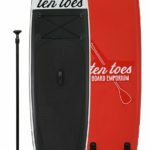 In my country, the price for Thurso Surf 10’7 is about 200 dollars more than the weekender. I understand it comes with Carbon paddle, and backpack and leash. But do the bonus items really worth 200? I think the Thurso Surf is worth the extra $200. Buying a bag of that quality will cost you the $60+. A leash is around $15. You can get really really cheap aluminum paddles but I definitely wouldn’t recommend that. The cheapest carbon fiber paddle (shaft and blade carbon) that you can buy on Amazon at the moment is $199. The Thurso Surf also has 3 removable fins so you can change the fin setup depending on where you’re paddling. Would love the black & red board ,but why did you put the red on the bottom??? Unfortunately, that’s not up to us. TenToes designed the boards we just review them. 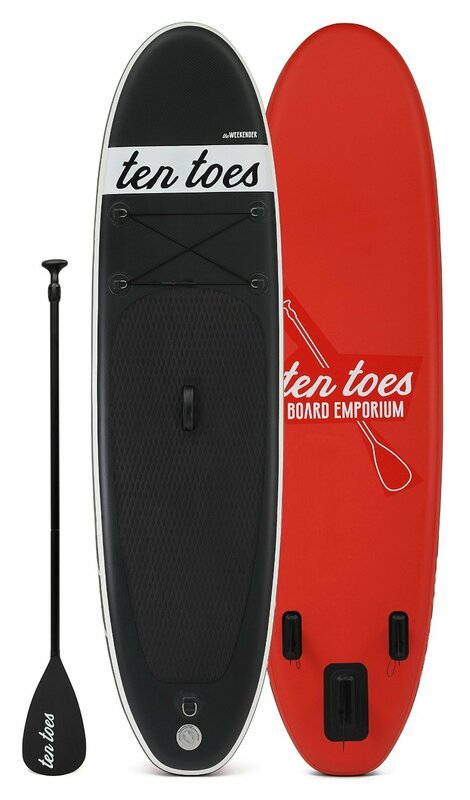 Would this be suitable for 6’2″ 250lbs mixed ocean lake use, or better of with the iRocker or Thursosurf you rated in top inflatables with wider waist? Not at all, unfortunately. You will definitely experience some flex and the performance will be far from great. At your height/weight I’d recommend the Model XL by Blackfin. You will definitely need the stability and they use awesome materials that make the boards extremely stiff. The iRocker All-Around 11 could carry you, but you wouldn’t enjoy its performance. Hey thanks for the review. Based on your review and others (they have all rated the Weekender very high… I purchased on used for a great price. The only other board I tried was when I rented an NRS Thrive. I know the price points for both boards are very different but from what the thrive seemed to perform much better….how do you feel the weekender stands up against the nrs thrive? The Ten Toes is decent considering the low price point. It doesn’t compare at all to the NRS though. The Thrive is a significantly better board in every aspect.